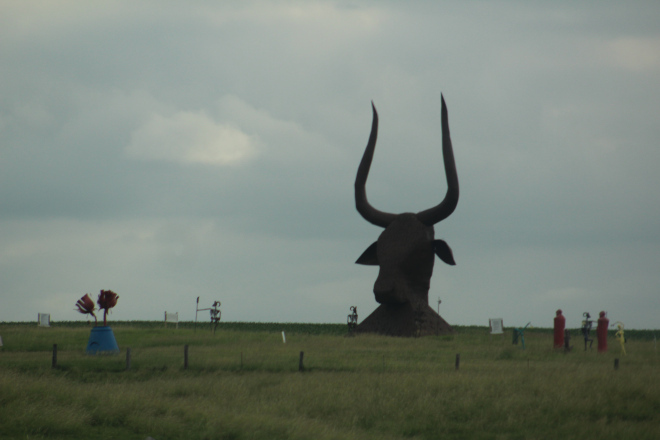 This quite possibly could be a minotaur still protecting his labyrinth. If you look closely there are minions protecting him as well… it just made the list of ‘must sees’ to get to the truth! One of the best aspects of cross-country road trips are the signs, billboards and random artifacts you come across. In the United States you can come across a lot of kitsch. There is even a book and now website about roadside America. Thus, whenever I go on a road trip, which is quite frequent, I bring my camera and am ready to snap away. Just last month, I took my 5th cross-country road trip across the US. Instead of I-80 we took I-90 for a change in scenery. And boy it was worth it! South Dakota, in particular, provided me with tons to photograph. I snapped away close to 1000 photos across the 300 odd miles it takes to get across South Dakota. This entry was posted in Observations by simplygiselle. Bookmark the permalink. thanks for the reblog! I like your take on it! I couldn’t resist, it was too awesome a photo!